Is Southwest Airlines Down Right Now? Yallll Alice at @SouthwestAir stopped responding but i still got more questions. @SouthwestAir my flight from Cleveland to Florida is delayed. Any insight as to why? Landed @MCO @SouthwestAir next stop... @jerseymikes !!! So @SouthwestAir system is down and I have a flight in an hour. Cool Saturday. Of course I wake up to @SouthwestAir canceling my flight and now the app won’t work and no one is answering the phone. Great service. 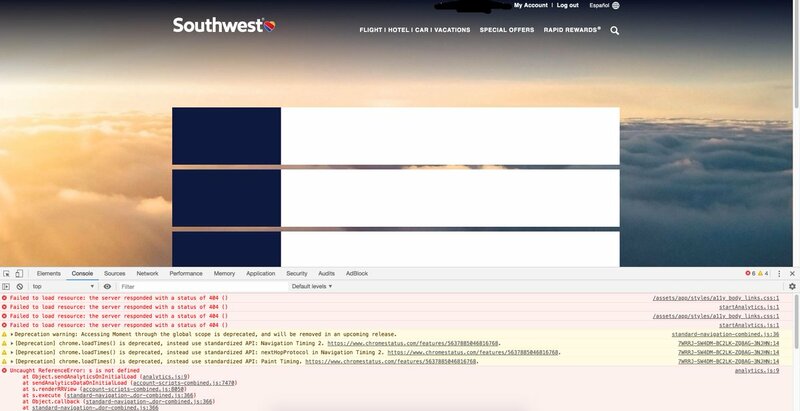 @SouthwestAir Hello Southwest, I'm having issues logging in/booking flights. Is the reservation system having issues? @SouthwestAir For some reason the "My Account" page on your website doesn't seem to be working. Do you know when this will be fixed? Hey @SouthwestAir, fix your issues and stop ruining my birthday weekend. @SouthwestAir Please help this family!!!!! @SouthwestAir what is up with this? When did ever corporation become so evil? @SouthwestAir ?? @SouthwestAir WiFi is broken on the plane? Come on now....not cool. Hey @SouthwestAir, your "My Account" app is broken in Firefox. Working in Chrome it seems. @SouthwestAir I have a question about my flight and reservations showing an error message when I go to check my itinerary. Help!! !